OS X 10.5’s Quick Look mode is a great way to preview a bunch of files in a folder, especially image files. Just open the folder containing the images, press the Space Bar, then use the arrow keys to move through the images in Quick Look. 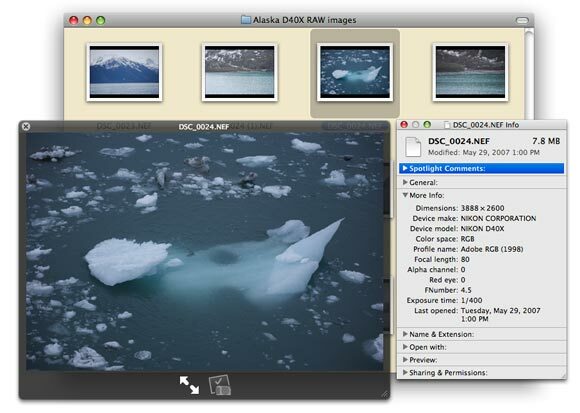 However, while Quick Look mode lets you see exactly what each image file looks like, it won’t tell you anything about those image files’ particulars: the full path to the file, its ownership and permissions, and—perhaps most relevant for an image—some of the EXIF tags for the pictures being browsed. So here’s how to both view your image and see EXIF (and other) information at the same time: just open an Inspector window alongside the Quick Look window. The Inspector is the floating, always-updated relative of the Get Info window. To open an Inspector window, hold down the Option key, then choose File -> Show Inspector (or just press Command-Option-I). This will open a floating window that constantly changes to reflect the currently-selected file or folder. Open your folder of images, press the Space Bar, and position the Quick Look and Inspector windows such that you can see them both. Now browse around using the arrow keys, and as you select different images in the Finder, both the Quick Look and Inspector windows will update to reflect the new selection. (As seen in the screenshot above, you can close the disclosure triangles in the Inspector window for sections that you don’t need to see.) While most useful for images, this combined mode can also be used to do things like check the ownership and permissions on a number of files, or to insure that you’ve set the same Spotlight Comments for some related files that you’d like to find with a Spotlight search. When you’re done Quick Looking, just press the Space Bar to exit Quick Look mode, and Command-Option-I to close the Inspector window.